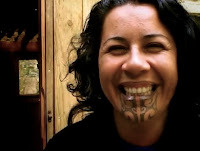 Tia Taurere is a Greenpeace communications officer. She is also linked to a network of radicals, many of whom are connected to the "Urewera 17." Tia Taurere's Bebo page (now private) lists her friends-many are radicals and some are involved in the "Urewera 17" or its support network. Key friends listed include "Urewera 17" arrestees Tame Iti and Rangi Kemara. Others include Taurere's best friends Teanau Tuiono and Kiritapu Allan, both of whom had their homes searched by police in the October 15th swoop. Also named is Annette Sykes (Tame Iti's lawyer) and her former partner, Maori radical Mike Smith. Two further activists are listed, both of whom were named in the leaked police affadavit as allegedly being connected to the Urewera "quasi military" training camps. One is the daughter of well known Taranaki based activist. The other is a former business partner of one of those arrested. Another "friend" has the same very distinctive Christian name (missing one vowel at the end) as another person named on the police affadavit, but never positively identified. Interestingly two pakeha anarchists are also listed as "friends". One is former Green Party worker, Rayna Fahey, who now works closely with Melbourne base "Urewera 17" solidarity activist, Sina Ana Brown-Davis. The last is none other than Green Party MP, Nandor Tanczos, Rayna Fahey's former boss. When challenged by NZ Truth to tell police what he knew, Tanczos backpedalled, stating it would be a "waste of time". Further, Mr Tanczos denied knowing any of those arrested in the October anti terror raids except Tame Iti. This was despite of being photographed on February 14th 2006 holding a Save Happy Valley banner in the grounds of Parliament with Val Morse, one of the country's most well known activists and an "Urewera 17" arresteee. Mr Tanczos clearly knows Tia Taurere well enough to link back to her Bebo page. Tanczos also links to Tame Iti's lawyer Annette Sykes and to the wife of an activist named in the police "Urewera 17" affadavit. Does Mr Tanczos know more than he is letting on, or is this just all unfortunate coincidence? On a more serious note talking about the future doesnt make you a criminal. And the cops have enough power to bug and monitor anyone seen as radical I don't think they need Nandors help. Also I've watched you attack those on the left that break the law when there appears to be no other option yet you feel justified to do the same with the affidavits? Hope your having a nice christmas break. I remind you trevor knowone has been charged with terrorism and no terrorist acts were commited, please stop from doing 'truth' or fox news style gutter journalism and using incorrect information. Again the only terrorist action of recent history was the French bombing of the rainbow warrior, and they largely got away with it and one of those agents is now an arms trader living in the United States of America. Are things getting a bit desperate in the ol' conspiracy revelations circles? If so, here's a hot tip as a Christmas present - some years ago I was walking home and ran into Mike Moore, the then PM who went on to head the WTO, and had a brief chat. I gave him a McGillicuddy Serious Party manifesto, which he promised to "read very carefully". Significantly, under Moore's leadership the WTO conspicuosly failed to make progress on free-trade. Could it be that Moore, under the influence of leftist radicals, deliberately sabotaged global free-trade? Oh, and the comment about the Rainbow Warrior isn't totally correct, the clearest example of terrorism in recent NZ history was the anti-union Trades Hall bombing in Wellington in '83, which killed Ernie Abbott. While the Rainbow Warrior bomb was designed to sink the ship, the Trades Hall bomb was designed to kill, being placed in a case with a trigger to detonate the device when the case was picked up. Worth noting that both incidents targetted the left. I don't think the Rainbow Warrior attack can be characterised as having occured specifically as an attack on the left; the French government undertook it because they believed it would further their national interests; their president at the time was a socialist afterall. Sam-glad you brought that up. I've posted before on why i think the SUP were behind ernie Abott's murder. it was '84 BTW. Likewise the rainbow Warrior case has a few interesting little known facets. I'll be posting on that in the New year. Opps I did not mean to imply that being a socialist made the French president a terrorist. "Also I've watched you attack those on the left that break the law when there appears to be no other option"
And the end always justifies the means eh Anon? No exocet just that Trev appears to be ok breaking the law when it suits him but attacks others for breaking ht law when it suits him. Wahoo! finally some real evidence, the master network discovered by Trevor on Bebo. Trevor you better check out Hi5 and myspace too mate, there might be more commie devils on their friends lists on there too that you missed. Idiot! YOU ARE A BEBO STALKER....AND SO PROUD OF IT. whats that? further proof needed? trevor ... um... oops all out of trevors for the southern hemisphere -there was one trevorette in the northern but she died of enlightenment when contrary to what she'd discovered on bebo- fred darwin wasn't actually a cross dresser after all, merely a man pretending to be a woman cross dressing as a man...whoah.